Athens, Greece (CNN) -- Police sirens and tear gas filled the streets around Greece's parliament building Wednesday after protests against government spending cuts turned violent, then deadly, with three people dying in a fire inside a bank. The demonstrators are furious at what they see as plans to take money out of their pockets. "I've been working 38 years in the private sector. I live a simple life. I never took money from anyone," one man in the crowd said. "And now I owe a lot of money to the borrowers -- I don't know who else." 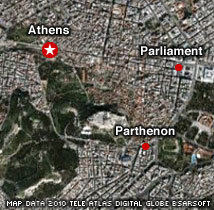 Three people died after a fire bomb hit a bank in central Athens, the Greek fire brigade told CNN. The victims, two women and a man, were bank employees, they said. Protesters were throwing bottles at police guarding the burned-out bank, shouting "torturers" and "liars" because they said they don't believe people were killed inside. Riot police were moving in to push the crowd away, CNN's Diana Magnay reported from the scene. When asked about the casualties, a protester outside the bank expressed disbelief. "I'll believe it when I see it," he said. Alexandra Lekka, a secondary school teacher who stands to lose 150 euros (about $192) a month from the new austerity measures, said the nation was in shock. "I cannot breathe. We are all frozen now," she said. "Everybody is very sad and very angry. I don't know what is going to happen." One woman in the bank died trying to reach an upstairs balcony, and the other was found trapped in an attic, medical examiner Filippos Koutsaftis said. The man was found coming down a staircase, he said. All three victims were between 32 and 35 years old, the ministry of civic protection said. The ministry said one of the women was pregnant, but the medical examiner refused to confirm it. All three appear to have suffocated, having inhaled toxic gases and smoke, the medical examiner said. Prime Minister George Papandreou issued a strong statement against the protesters who turned violent. "There can be no shelter, no direct or indirect political support for them," he said. "Each citizen has a right to demonstrate," he said. "But no one has the right to resort to violence, especially violence leading to the murder of our citizens. And we know that violence produces violence. Protest is different than murder." The austerity measures the country plans to implement are designed to prevent Greece from going bankrupt -- which would hurt working people the most, he said. "Bankruptcy would not touch the lives of the rich, only the working class, the pensioners who are already suffering," he said. Lawmakers held a minute's silence in parliament in response to the deaths at the bank, said Vassilis Papadimitriou, a spokesman for Papandreou. The Hellenic Bank Association expressed its "deepest sorrow for the tragic deaths." Garbage bins and cars were set on fire around the city. Flames shot out of two public buildings and a fire truck was ablaze near the Temple of Zeus, the fire brigade said. All over central Athens, riot police in helmets and shields kept back protesters who threw bottles, sticks, and rocks. Booms pierced the air every time the police fired canisters of tear gas at the crowds. Many of the protesters had scarves around their mouths and a white cream around their eyes to protect against the tear gas, a Canadian iReporter who sent photos from the scene told CNN. Lindsay Mackenzie, of Vancouver, ended up right in the middle of the crowd and was able to capture the scene as protesters flung objects at police and the police fired tear gas back at them. Eight people were arrested and more than 70 were brought in for questioning by Wednesday evening, the ministry of civic protection said. Twenty-three police officers and 12 members of the public were wounded, the ministry said. A mass of protesters made it onto the steps in front of the Greek parliament building early in the afternoon before riot police pushed them back. Thousands of protesters were still waiting to get into the square in front of Parliament Wednesday evening. Unions said about 10,000 people were on Stadiou street waiting to get in, but police put the number at a few thousand. Members of the parliamentary economic committee are inside the building reviewing a package of austerity measures to contain Greece's spiraling debt. The measures are highly unpopular in Greece and the protesters on the steps demanded that lawmakers come outside and face them. The protests happened amid a general strike by thousands of public sector workers unhappy with the austerity measures, which largely target them. Private sector workers joined them on the picket lines Wednesday, along with thousands of transport workers -- which brought transportation services to a halt. Police estimated there were 15,000 workers were on the streets of Athens, but unions said there were many more. Among them were teachers, bank employees and doctors. The ministry of civic protection put the number at about 30,000. Both the GSEE and ADEDY unions called on workers to meet at 6 p.m. Thursday in front of Parliament to protest the package of measures, the GSEE website said. Throughout the capital, about 1,700 officers stood guard to maintain order. The workers are protesting cuts in spending that the government says are needed to pull the country out of debt. The Greek Parliament is expected to vote on the austerity measures -- which include wage freezes and higher taxes -- by the end of Thursday. The Finance Ministry said the austerity bill goes before a parliamentary committee Wednesday and will be up for debate by the whole body the following day. Tuesday, about 2,000 protesters representing teachers from the public sector marched past the Finance Ministry and Parliament. In central Athens, protesters threw plastic bottles and sticks at riot police. At another demonstration, members of the Communist Party of Greece (KKE) erected large banners near the Parthenon. "People of Europe Rise Up," said one. The European Union announced a 110 billion euro ($145 billion) aid package for Greece on Sunday. Greek Finance Minister George Papaconstantinou announced the tough cost-cutting measures to meet European Union and International Monetary Fund conditions for the deal. The package includes a promise by Greece to cut its budget deficit to 3 percent of the country's gross domestic product, as required by European Union rules, by 2014, according to Papaconstantinou. The measures, he said, were needed for Greece to secure its financial lifeline. Greece has a choice between "destruction" and survival, and "we have chosen, of course, to save the country," Papaconstantinou said. CNN's Diana Magnay, Erin McLaughlin and journalist Mary Retiniotis contributed to this report.